« In Praise of Moi? I don’t normally make New Year Resolutions but this one has been growing in me for a while. Unexpected pleasures are a gift from the universe. I should take the time to share them. So this is my first. At a point in 2012 when life was full and sad, my good friend Anne Gracie sent me the present of a memoir by Eloisa James, who I knew only as a US historical romance author. It was about a year in which James lived in Paris with her family. Now, I have to admit I’m not a fan of Paris. My pen friend lived in a suburb (Plessis Robinson) and pretty much every trip we made into the city was attended by one of those humiliations which the Parisians are so good at dealing out. I admit that the agony can still sneak up on me, sandbag in hand, when I’m on the underground sometimes and my mind is drifting. I don’t hate France, you understand. I enjoy Bordeaux, love Beaune, was enchanted by Cannes when I went there with Anne McAllister researching one of her books. But Paris? There used to be a book of classic photographs to which some wit had appended appropriate captions. One of the pictures was a gargoyle from Notre Dame, a bitter, bored, resentful devil of a gargoyle, with its chin in its despairing hands and its tongue out. The caption? I hate Paris. I was with that gargoyle every step of the way. Well, Eloisa James has changed all that. She went to Paris with open eyes and an open heart and she has found treasure. She writes delectably (and with truly Christian lack of envy) about the artisan chocolate delights, the elegance of the women, odd corners she finds and the food, some of which is still melting away in my imagination, some of which is stomach-turning. She encounters a superior waiter of the species I remember with a shudder and she and her husband, responsible parents that they are, retreat from the restaurant to scream at each other out of sight of their offspring. The book started life as a blog and most of the entries are effectively snippets, intensely observed, often witty, sometimes heartfelt, encapsulating a moment as perfectly as a sonnet. This is a book you can genuinely read in an odd moment, when you need respite or you’re waiting for bread to rise, and take something of substance and delight from it. She takes longer to ponder bigger things. The neurosis that I suppose all writers share about losing words leads her to decide to start memorising poetry again, which I shall emulate. Her first is Auden’s Lonely Betters,which hitherto I would have said I mildly disliked, along with what I know of Auden, it has to be admitted. But reading it after James’s thoughts on her own language and her father, the poet Robert Bly, gave it a resonance which will have me return to the poem, I know. A surprising, thoughtful and charming book. I loved it. Still not sure about Paris, though. I always fancied the look of this but haven’t yet bought it. I will now! Thanks for the lovely review! You won’t regret it Imelda. I’ve read it once right through and now I hop in at odd moments to savour the specially good bits. A great pleasure Eloisa. Your book is a continuing delight. I’m delighted to know that Paris in Love sent another reader back to Auden. That was one of the effects the book had on me as well. I’ll be honest, it’s just the one poem so far, Janga. There’s a sort of ineffable superiority in Auden’s poetry that I resist – even in that love poem ‘Lullaby’. For instance, ‘Human on my faithless arm’ sounds to me like the god Apollo addressing the sleeping mortal, not a person I find myself feeling much fellowship with. But I’m going back and trying again . . . 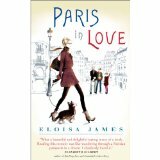 I loved this book, but then I read it because I love Paris! It did inspire to read Ms James’ other books, a genre which had not previously interested me. Jenny, for me, Auden has always been a poet of memorable phrases, lines and stanzas rather than one like Dickinson who has engraved countless poems in my head and heart. I once thought I’d write a novel and title it “The Suburb of Dissent” (from “We Too Had Known Golden Hours”) and I had the famous stanza from “Funeral Blues” by heart well before it was used in the movie Four Weddings and a Funeral. But I discovered new things in my rereading. For one, I found it interesting how many of his poems refer to stars or their lack.